An idyllic coastal getaway awaits this holiday season with elevated culinary offerings and unique spa treatments – a perfect way to ring in the New Year. 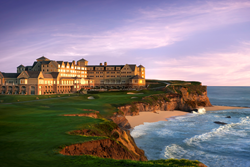 The Ritz-Carlton, Half Moon Bay – the iconic oceanfront resort overlooking 50 miles of Northern California coastline – welcomes travelers to enjoy an unforgettable holiday getaway along the coast, with a lineup of festive brunches and winter-inspired spa treatments. To kick off the holiday season, the resort will unveil a spectacular Christmas tree display on Ocean Lawn, adding a sparkling focal point to complement the majestic coastal backdrop. Guests can cozy up by one of the signature firepits at the adjacent Ocean Terrace with a warm cup of cocoa or glass of fine wine, and embrace the company of friends and family while taking in views of the festive tree and California’s famous colorful sunsets. KNESKO Gold Under-Eye Enhancement (November) – With its approach to treat the mind, the body and the spirit as a whole, KNESKO’s gemstone-infused collagen masks brightens the skin and brings a truly relaxing and rewarding experience. $30. Complimentary Seasonal Foot Scrub (November) Guests will receive a complimentary foot scrub enhancement with pine, pomegranate or peppermint selection with any 80-minute regularly priced massage. Winter Renewal by Tatcha (December) – Brought by Japanese luxury skincare provider Tatcha, the Winter Renewal treatment is designed to indulge the senses and invigorate the body. The gommage treatment gently exfoliates the skin with rare black sugar from the nutrient-dense shores of tropical Okinawa. The following massage gets rid of dead skin and relaxes the body. 80 minutes; $325. Includes full body massage and exfoliation on the back, hands and feet. Winter Express by Tatcha (December) – The Winter Express provides a short and sweet spa treatment with Tatcha’s Indigo Soothing Silk Body Butter and Indigo Smoothing Black Sugar Body Gommage that will leave the skin smooth and bright. 50 minutes; $195. Includes exfoliation on the hands and feet and 15 minutes back-only massage.